N/A English. Core. Dra is short for dragon. 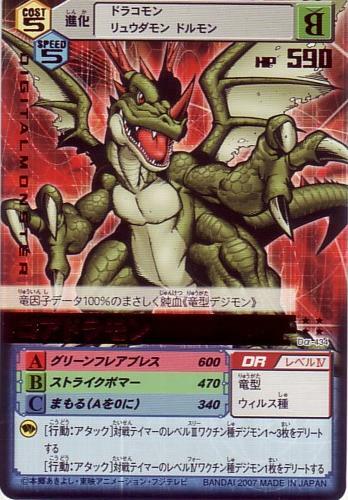 Dracomon, Ryuudamon, DORUmon "His 100% dragon data proves he's definitely a pure-blooded Dragon Type Digimon!" [Action: Attack] Delete 1-3 of the opposing Tamer's Level III Vaccine Digimon. [Action: Attack] Delete 1 of the opposing Tamer's Level IV Vaccine Digimon.